Sean Duffy is an intriguing character – a rarity in being a Catholic member of the RUC (that’s the Royal Ulster Constabulary or the police force that has since been disbanded in favour of the PSNI as part of the Northern Ireland peace process) in a period where any member of the RUC was a legitimate target in the parlance of the IRA but particularly a Catholic member who were viewly as being traitors to the cause but also as part of his backstory he was rejected in his approach to join the IRA (which adds some additional depth to what he may feel towards those current colleagues that refer both to him and other Catholics as Fenians) following Bloody Sunday as a former schoolmate told him the movement wanted thinkers as well as doers. Having continued with his university education he ultimately joins the opposing side prompted in part by an IRA incendiary attack on a bar frequented by university students that leaves many dead and injured. 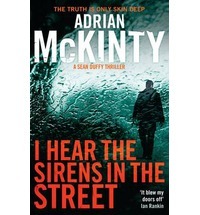 McKinty obviously knows his subject matter well as he is from Northern Ireland originally but as an author his reputation is enhanced by a number of award nominations. 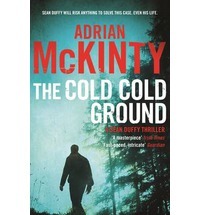 Kicking off with The Cold Cold Ground which won a Spinetingler award for best novel and which introduces us to Detective Sergeant Sean Duffy where he is called to a site where a man’s corpse has been discovered with one of his hands chopped off which in normal paramilitary style would indicate an informer whose hand has been removed for accepting 30 pieces of silver but this particular case shifts in an unusual direction as the post-mortem suggests it may be the work of a serial killer but once the victim is revealed as a senior member of the IRA other investigative avenues must be pursued which involve senior political figures, a missing woman that has turned up dead but having recently delivered a baby and her ex-husband who has joined the ongoing hunger strike not to mention collusion between those best-of-enemies – the Loyalist and Republican paramilitaries. Perhaps it is best described by McKinty himself as “a police procedural but a procedural set in extremely unusual circumstances in a controversial police force cracking under extraordinary external and internal pressures”. The second book in the series is I Hear The Sirens In The Street. With a guest appearance for John DeLorean who was supposed to be the saviour of the province if only the car that bore his name had been more successful commercially rather than just in the movies (that and the small matter of a FBI drugs bust) but the discovery of a body in a suitcase in the grounds of his factory at a time when everyone is still enthralled with him leads Duffy to another open murder case which is presumed to have been paramilitary in nature but the pieces of the puzzle don’t fit together easily leaving Duffy to antagonise not only his colleagues and the Northern Ireland citizenry but the FBI as well. The book incidentally also features my new favourite word – kakistocracy which means government under the control of a nation’s least-qualified citizens. 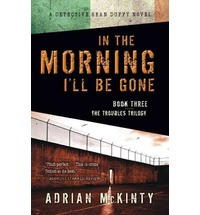 The soon to be published In The Morning I’ll Be Gone manages to spring a couple of surprises in that Duffy finds himself off the force early in the novel but is reinstated courtesy of MI5 and tasked with tracking down his former schoolmate Dermot McCann – the man who spurned Duffy’s advances to join the IRA. In the course of his investigation he meets both Michael Forsythe (the hitman who features in McKinty’s other trilogy comprising Dead I May Well Be, The Dead Yard and The Bloomsday Dead) as well as Annie McCann the divorced wife of Dermot and another former schoolfriend. Her mother confidentially promises Duffy inside information on Dermot McCann’s whereabouts if he investigates the death of her other daughter and it is this case which transitions In The Morning I’ll Be Gone most unexpectedly into a locked-room mystery. I loved this series and have no hesitation in recommending them. I rated them all 10 out of 10. I may even be inspired to search through the dreaded TBR pile for some more of McKinty’s work which I know are in there somewhere. Further details are available from his personal site as well as his respective UK and US publishers. Am very much looking forward to the last book in the trilogy.